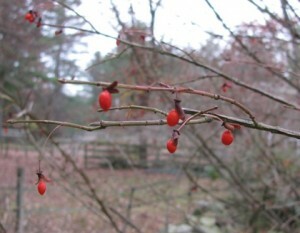 Researchers at the Connecticut Agricultural Experiment Station have painstakingly developed a sterile triploid cultivar of Euonymus alatus, winged burning bush. This ever-popular landscape plant has created dense thickets when it escapes into forests. The process for developing the sterile cultivar is being patented by the researchers and the University of Connecticut. It will take several years before the sterile plants are available at a nursery near you. Sales of burning bush currently reach $38 million/year in the U.S.
Thammina et al. 2011. In vitro regeration of triploid plants of Euonymus alatus ‘Compactus’ (burning bush) from endosperm tissues. HortScience 46:1141-1147. This entry was posted in Euonymus alatus, Research and tagged Euonymus alatus, horticulture. Bookmark the permalink.